As someone who was deeply involved in the Republican and conservative political scene in Ohio for many of the Kasich years, I want to shed some light on John Kasich’s history as Governor. It’s important to note that not a single item below is my opinion. This is a simple telling of the facts. I do not work for any political party, candidate, campaign, committee or advocacy group of any kind. In fact, I’m not asking you to support any specific candidate. What I am asking, is that you NOT vote for John Kasich, and in the paragraphs below I will tell you exactly why. Why am I telling you this story while many others who know Ohio have not? Because so few of those involved in Ohio politics will risk speaking up due to Kasich’s stranglehold on Republican politics in the state. Bottom line – no one wants to pay the price of picking a fight with a sitting Governor. When looking at John Kasich, there are two distinct stories that can be told – one is that of an Obama-like policy agenda, and the other is the story of a man who has run Columbus with intimidation and threats rather than consensus and coalition building. For now, I’m going to stick with what I know best, and focus on his policies that declared war on personal and economic freedom in Ohio. The unfortunate truth about John Kasich is that he has advanced wealth redistribution while spending taxpayer money at record levels, and has actively inhibited the economic opportunity Ohio so desperately needs. 1. Governor Kasich on Obamacare: You advanced Obamacare in Ohio, turning over 600,000 healthy, working age adults into government dependents, costing taxpayers billions of dollars and expanding the largest long term obligation in Ohio history – all against the will of the Republican controlled Ohio House and Senate. Given that these 600,000 Ohioans would not be government dependents had you not bypassed the legislature and vetoed their wishes so you could accept Obamacare funding and conditions – how can you say you oppose Obamacare while unilaterally championing its single biggest component? 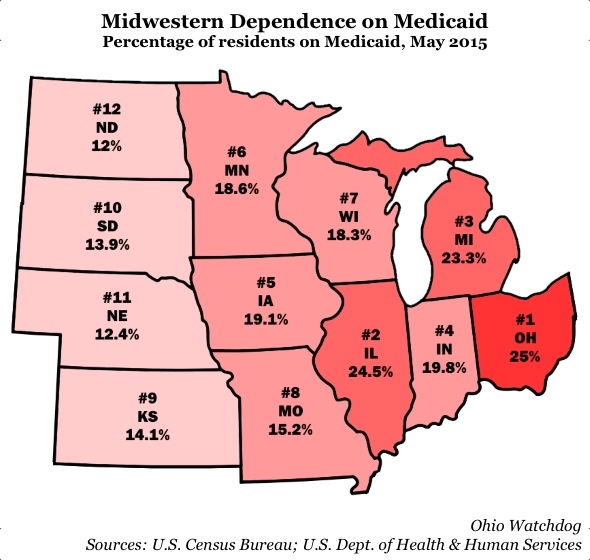 If you want to see the full chronicling of this heartbreaking path to Obamacare expansion for Ohio, which now leads the Midwest with 1 out of every 4 Ohioans dependent on government for healthcare, read the detailed account here. Ohioans, let’s be brutally honest about this Kasich decision to expand Obamacare in Ohio. You and your children are being indebted by billions of dollars all to redistribute this money to healthy, working age adults. Not children, pregnant mothers or truly medically fragile people, no. The people Kasich added as government dependents were healthy adults. The inarguable fact is that – this is Ohio’s largest state based expansion of socialism since Lyndon Johnson was in office, and John Kasich used his executive power to override the legislature to make this happen. He holds sole responsibility for this massive problem. 2. Governor Kasich on Spending: You talk about balancing the state budget, but every Ohio Governor balances the budget every year as it’s a Constitutional requirement in your state. 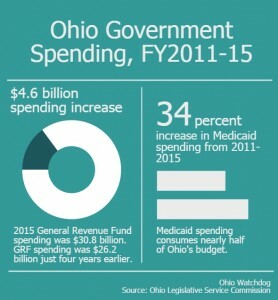 Democrat or Republican – every Ohio Governor does this, as it is regular and expected. This is not a unique accomplishment. Of greater interest is that Ohio’s job and economic growth has lagged behind the national average during your time in office. As we all know, the national economy has improved since the crash of 2008, so tax revenues have increased in both Ohio and across the US. But, as Ohio state tax revenues increased, curiously, so did your spending at a much faster pace. Governor Kasich, how can you justify increasing spending by greater amounts than any Ohio Democrat or Republican Governor since 1990, outpacing both inflation and population growth, but still call yourself fiscally responsible? Yes, the exploding expenditures in Ohio are real. Read more about record state spending under John Kasich here. 3. Governor Kasich on Unions and Big Labor: Every US state with a Republican Governor and Republican controlled Legislature has ended compulsory payment of fees to unions and become a “right to work” state with the exception of Ohio. As the Ohio border states of Indiana, Michigan and West Virginia have all become “right to work” states during your time as Ohio Governor, not only have you failed to make Ohio a “right to work” state, but you actively pushed Michigan’s Governor Snyder to oppose right to work legislation, you have killed Ohio right to work legislation in committees multiple times and you proactively worked to stop Ohio donors from funding a citizen’s initiative to make Ohio a right to work state through a vote of the people at the ballot. Ohio’s current ranking is a dismal 38Th in job creation, so while you fought against ending forced union dues payments, right to work states dominated job growth across the country. How can you call yourself someone committed to an environment conducive to job creation when your actions and results in Ohio have protected unions and inhibited job growth? While John Kasich has actively opposed right to work, and any other union related reforms since 2011, job growth in Ohio has been outpaced by most other US states while the overall number of Ohioans participating in the workforce continues to decline. On three of the biggest issues for Republicans and conservative voters: Obamacare/Wealth Redistribution, Fiscal Responsibility and Jobs/Economic Opportunity, John Kasich fails miserably. What makes the list of policy disasters above even more intolerable to so many Ohio Republicans and conservatives is that Kasich ran for Governor as someone else. He looked us in the eye, often one on one, and promised to be different than the Democrats, but we got just the opposite – more spending, more government dependents and the same union protection we get with Democrats. Maybe the average Republican voter could forgive the abandonment of principles if they were actually productive, if they were actually yielding results. Instead, Ohio has below average job growth, terrible workforce participation and is staring down the barrel of multi-billion dollar obligation that will only hit the state when Kasich has left office. Ohio taxpayer – when Kasich is long gone, it is you and your children who will be left with the mess he has created. It is you who John Kasich has left holding the bag. On March 15th, choose anyone but Kasich. I won’t go into such detail on his other failed policy and positions, but here is a brief list of a few other items where Kasich is out of sync with most voters who identify as Republican, conservative, libertarian or generally center right in any way. – All this with a Republican controlled legislature, so there is no excuse for not advancing better tax policy. – Kasich created a non-auditable 501C4 called JobsOhio which uses revenue from state liquor taxes to offer incentives, loans, etc to chosen businesses. Remember Obama’s Solyndra mess? This is the same thing, but it’s not even auditable. This entity picks winners and losers with taxpayer money with absolutely no accountability. – This crony entity was created by John Kasich, and he considers it top achievement. The perceived necessity to create such an entity, to effectively bribe businesses to work in Ohio, acknowledges how terrible a business climate Ohio really has. Businesses aren’t looking to grow or move to Ohio. They have to be bribed to do so, and even then – the results show that it is not working. – In her 2016 CPAC speech, Michelle Malkin lampooned the Kasich hypocrisy on this issue. You can see it here. Chris Littleton is the former Ohio State Director for American Majority, a conservative candidate training organization. He is also Co-Founder of the Ohio Liberty Coalition and Ohio Rising, both Ohio based conservative non-profits dedicated to advancing freedom friendly policies in Ohio. Chris is currently the Director of Operations at Voter Gravity, a database and technology firm helping hundreds of Republican clients across the United States win elections. This article represents Chris Littleton’s opinion alone, and was not written on behalf of any political party, organization, advocacy group, company, candidate or committee. If you’d like to contact Chris, you can reach him here. Disregarding all of the list above, I still wouldn’t vote for Kasich because of his actions as a governor of Ohio. I am ashamed that we would have a person representing our wonderful state to act so arrogate. Interesting remark about due to the “I” not showing up in all the comments, that they were all generated by the same person. So, I’m typing out i’s to see if somehow they’re getting removed mysteriously by the ‘system’. So, here is another I. Here’s a lower case I, plus more i’s, indescribably ridiculous that all the i’s should disappear. So, although all those comments without the i’s were written in negative support Kasich, I can’t figure it out if they (the i’s) show up in my comment. Mark Levin blasts Kasich and really, that’s all I need. So why is Kasich still in the race when he knows he can’t win? The only reasonable reason (which is pretty weak!) is that he feels that somehow he can help influence the campaign or is running to get a piece of the action when Trump or Cruz beats the sh!t out of Shilary. Neither is a good reason. What do YOU think? There you have it! The system removes all the lower case I’s. Trump, Obama and Kasich would be lost with this system!!! Kasich has also continued the Third Frontier Program began by Rino Bob Taft and continued by Ted Strickland. This has driver the State further into debt with no accountability of Jobs created. Kasich disingenuously claims he’s against corporate welfare while simultaneously supporting industrial wind, which would NOT even exist without the taxpayer-funded subsidies & incentives that cronies in high places keep in place to enable the wind industry to exist — ie: the Wind Production Tax Credit – PTC (aka: Pork-To-Cronies). Anyone (ie: John Kasich) who says they are for an “All of the Above” energy policy is pushing Obama’s ‘green’ ($$$) energy scam – a massive redistribution of wealth scheme that “necessarily skyrockets” our electricity rates, just as Obama promised it would. I am not a Kasich fan, but he is the only one who has a chance of beating Trump in Ohio. I want Cruz to win overall, but I’m voting for Kasich because I want to deny Trump Ohio’s delegates– winner take all. Kasich has very little chance of winning the general, but Cruz has a better chance of winning the general if Trump is denied the Ohio delegates. If you really want someone to beat Trump, you need Kasich out ASAP. He has no chance to win, but every state he stays in takes votes from Cruz as the more dominant alternative to Trump. Kasich said he’d drop out if he lost Ohio, so the fastest way to help another candidate is to get Kasich out ASAP. If not, you are prolonging the vote splitting and giving even more delegates to Trump with all the winner take all states after March 15th. A Kasich loss in Ohio gets him out of the race. That’s good for everyone. That strategy won’t work. the GOP wants Kasich for VP. If you vote for Kasich Trump will get his delegrates. The only way to stop Trump is to vote Cruz. He should be running as a Democrat!!! The only difference is the R behind his name!!! I’m ashamed of the state of my birth for electing this Democrat!!! You know, I think this article is right. John Kasich’s problem is, he’s running for the wrong party. If he were to switch sides and run on the Democrats side, he could give Hillary and Bernie a serious challenge. A referendum (which he was behind) issuing Ohio bonds of $1.8 billion each year for ten years to repair roads and bridges and be repaid starting in 30 years passed about three years ago. Is this not part of his claim to balancing the budget? Previously the repair of roads and bridges was paid as we went. Then there is his comment about deporting illegal immigrants, where he says deporting them would disrupt families. So once they make it across the border and to Ohio, they are safe. Thank you Chris, as always you are a wealth of knowledge for our state. I certainly will be passing this information on to unsuspecting Kasich supporters that I know. Bless you! Thanks Chris, great information. Question, where is the Clermont County Tea Party on informing voters about that famous conservative Brad Wenstrup? Mr. Wenstup stood behind John Boehner completely. In numerous interviews he refused to say anything negative about Mr. Boehner, in fact, he supported Mr. Boehner. Now I hear his commercials about how conservative he is. This is exactly the type of performance ( campaign one way, get elected and the true RHINO colors are exposed) that has led to such unrest in the Republican Party. It’s the continued arrogance of disregarding the voters initially responsible for his election. Brad Wenstrup, conservative, wants to withhold legislator’s pay. What a contrived issue to make himself look good. If he wanted to be a real conservative,,he could have taken a stand against John Boehner. Meet the new boss, same as the old boss. You know, I thought it was really strange that nothing, nothing was heard about SB5 except for a steady onslaught of union hatred about how bad it would be for Ohio. The Republican party did nothing and basically let the unions have their way. Thank you so very much for sending this information, Chris. Your information is accurate and timely. You have been thorough with your studying and reporting of Kasich for many years. Thanks! Chris, Thank you for your comments even though they do not begin to cover all of the sins of Governor Kasich and for which I call him Obama-lite. All of your comments are true regarding Kasich and unfortunately the voting public is totally ignorant of such for the most part. In addition to the above, he also conspired with the State Legislature to remove third parties and their competition from the ballot and thus remove the people’s right to choose the candidate that most closely aligns with their political viewpoint. This was done via SB-193 which I labeled “The John Kasich Assured Re-election Legislation” in that it attempted to eliminate (and eventually did after 2014 except for the Green Party for the moment) all Third Parties in the State. It particularly was aimed at removing Charley Earl, the Libertarian Candidate for Governor, from the ballot when Kasich was worried that Earl would steal enough votes to give the election to the Democratic candidate before the Democrat pretender self-imploded his campaign, thus giving Kasich the major victory in Ohio he now touts as one of his major credentials for President. Of course, Kasich fails to mention how many eligible voters did not vote for any Gubernatorial candidate in the last election compared to the previous election. 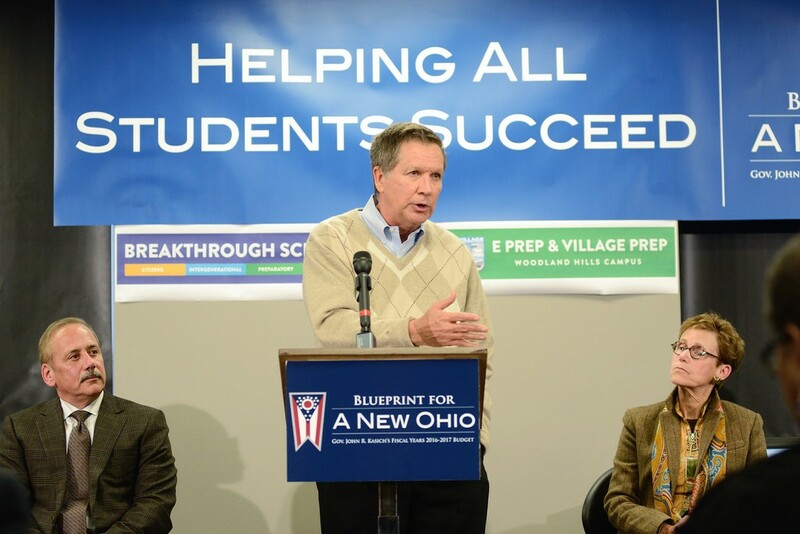 Then there was the income redistribution, alluded to in Chris’ article wherein Kasich took money from the wealthier school districts in order to give the money to the poor ones to make education fair to all. I guess as long as income redistribution is for the school children it is OK, at least according to Kasich and the Republicans in the state, much less the Democrats. Then there was the jobs bill, also referenced by Chris, wherein Kasich and company saddled our grandchildren with debt in order to “create” jobs in the state via “free” state money. In Preble County much of that money went to fund projects that had already been completed. Of course, there is the action by Kasich and Republicans taken just before the current election cycle to change the state from a proportional state in the Primaries to a “winner-take-all” state in the expectation that Kasich would win Ohio and thus give him considerable influence at the upcoming Republican Nominating Convention. He is not likely to win the Presidential nomination but he certainly expects to influence who does as he aims for a possible VP slot and especially as he conspires for 4 – 8 years from now for the nomination. As long as he receives more votes in Ohio than any of the other of the candidates, he gets all of Ohio delegates committed solely to him by the new state election law. This is why there was no way he was going to drop out of the race until after the Ohio Primary. If he wins Ohio, he will never drop out; only if he loses Ohio will he consider dropping out. While the list of such shenanigans by Kasich is long, too long to go into here, the above list in addition to those listed by Chris, should give voters at least some idea why true Constitutionalists and conservative Republicans do not support Kasich or are backing away from supporting him.